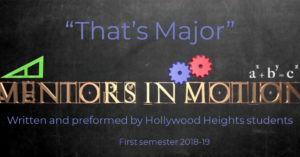 Hollywood Heights students created a song and music video titled “That’s Major” to promote the importance of success in school. The video was a project with St. Louis based program Mentors in Motion. MIM uses “tools such as music, technology, career development, healthcare assessments & education and current curricular assistance” to empower at-risk youth to make good decisions and stay in school.